This was a neat story, which kept me reading even though I didn't love the writing. Which in itself is kind of interesting: how does someone who can clearly write a fine sentence, and who has this really fascinating story with neat characters, ever-so-slightly miss the mark? It's not terrible writing, just a bit flaccid—there's a marked lack in dramatic tension and managing of the plot, which is such a shame because Gibson uncovered a real gift of a good story. And in the end I'm glad I kept going, because Gibson's obvious affection for his protagonist really carried the day. Basically, I wanted to find out what happened to him. Ultimately, I wouldn't NOT recommend the book, but I would make sure to add the caveat that the writing's on the slack side. Gregory Gibson, an antiquarian book dealer himself, has written the story of Bob Langmuir, a rare-book dealer who comes across a treasure trove of documents and Diane Arbus photographs relating to an old Times Square “dime museum”, Hubert’s. 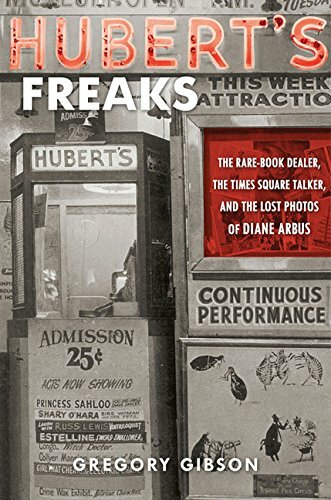 Hubert’s Freaks: The Rare-Book Dealer, The Times Square Talker, and The Lost Photos of Diane Arbus is the true story of Bob, Charlie Lucas (the Times Square Talker) and the clash of the high-end art world and the low end world of e-Bay collectors and dealers. Gibson has a fascinating story to tell, with Langmuir at the center. Gibson seems to have given us a full portrait of Langmuir, whom he has an obvious sympathy for. The strict control of the Arbus name and body of work by the estate is probed along with the behind the scenes jockeying by the Institutions of the Fine Arts world. Arbus herself is given short shrift, so if you’re looking to discover more about her personally, you’ll need to look elsewhere - that’s not the intent of this book. The subculture of freak shows and urban carney museum’s is opened up, but just enough to whet your appetite. Mostly it’s about Bob and the process of his discovery and the travails of his personal and professional life subsequent to his find. From the outset I should let you know that Greg Gibson, the author of this work, has been a friend of mine for over 30 years. And the protagonist of the story, Bob Langmuir, is a guy I first met nearly 20 years ago. That having been said, this is a whale of a yarn. In true page-turner style "Hubert's Freaks" intertwines the disparate worlds of Times Square's seedy culture of the 1950s and 60s, the sub-culture world of sideshows and freak shows, the black American world of inner city poverty, the hip musical world of blues and jazz, the decidedly weird world of famed photographer Diane Arbus and the images that she produced in her short lifetime, the rarified world of major art museums and auction houses, and the often mysterious workings of the world of the rare-book seller. All in 263 pages. And to add a further timely dimension to this saga, the upcoming event that is talked about on the final page of the book was the subject of controversial headlines in the New York Times just two weeks ago. What becomes of a small-time dealer in rare books when he stumbles upon a possible photographic goldmine? This is the scenario of Hubert's Freaks, by Gregory Gibson. While soul-searching his way through life, Robert Langmuir has always found himself with a love for African-Americana. In his continuing struggle to keep his used bookstore afloat, he traveled the east coast in search of both books for his shop and collectibles for his soul. Fate was on his side when he stumbled upon an auction of an abandoned storage unit. Among the many unusual circus style artifacts that were being snapped up by dealers was a trunk full of photos, notes and diaries. Seeing these photos, it became obvious that this storage unit belonged to an African-American performer. Time for Robert to feed his soul. He was able to acquire about half of these paper goods. After getting his stock home he started looking through the details of what he had just acquired. Among these items was a date book. This date book represents a turning point in the life of Langmuir. An entry reading, "Diane Arbus, 131 1/2 Charles St, WA-4-4608., morns 8-10 eves 6-8". Even more incredibly, the handwriting differed from other writing on the page. It appeared (especially in the writing of the name itself) to be written in the hand of Diane Arbus! What did this mean to the photographs? Could they, too, be from the same hand? It became Robert Langmuirs "calling" to find out. What follows is years of legal wranglings, attempts to authenticate the photos and a goal of selling the works for a deserved price. This is a book about Robert Langmuir, his professional, personal and spiritual trails. This is not a book about "Hubert's Freaks". For me, there is precious little information pertaining to this small, African American run, dime museum. The author touches on the fact that he took part in an interview with a relative of the show's proprietors, Charlie and Virginia Lucas, however, after the initial haggling as to the parameters of the interview, there are no details as to what was said. Considering Gibson does recognize the importance of this lost part of Americana, I found this disappointing. fascinating people, most beautifully tied together.